501-A - Small Adjustable Writing Slope - 14"H x 16"L. 9 lbs. 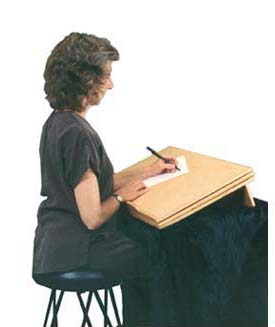 502-A - Large Adjustable Writing Slope - 14"D x 24"L. 11 lbs. 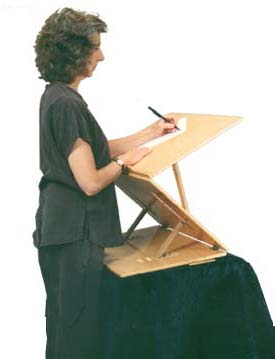 504-A - Sit-Stand Podium Slant Board - 16"D x 24"L. 14 lbs. 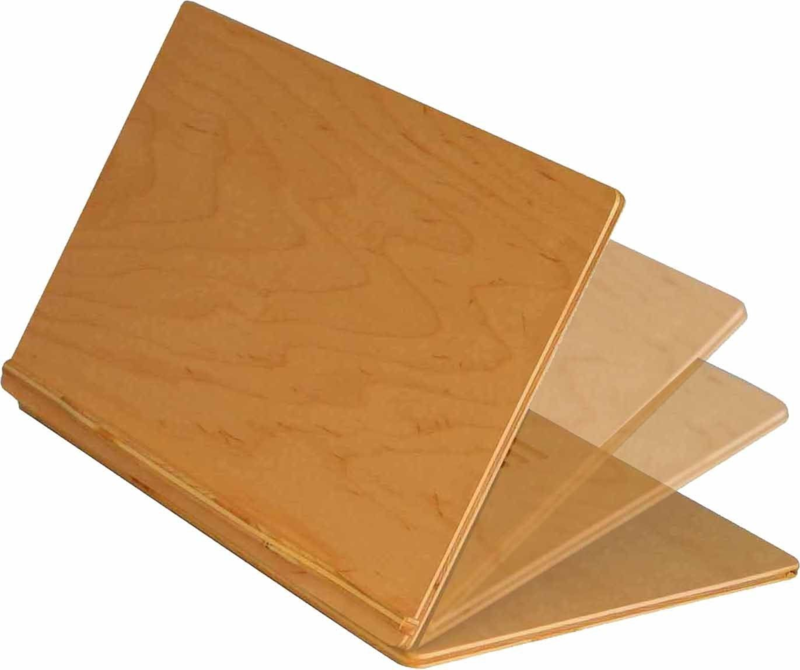 Slantboards are a neck-saver for office workers, teachers, students, writers and artists. 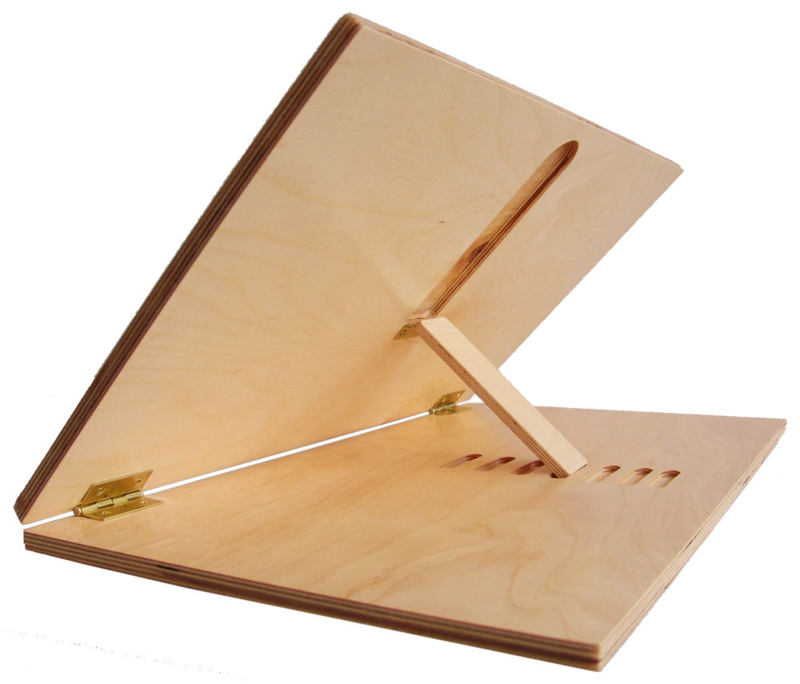 Our Slant Boards Have All the Angles! Discover what draftsmen and artists have always known: working on a sloped surface reduces back and neck pressure, as well as eye strain. You experience less fatigue and improved concentration. Ten angle adjustments for personalized writing and reading comfort. Hand crafted in the USA of durable hardwood ply. Non-glare, low-contrast polyurethane finish is easy on the eyes. Bottom ledge hold pens, papers and books. Transform flat surfaces into an ergonomic desk that adjusts from 15° to 65° for personalized comfort. Reduces neck, back, and eye strain. Recommended for office workers, teachers, students, writers and artists. Seven adjustment angles from 15° to 65° promote good posture and enhance comfort while reading and writing. Handcrafted in the USA of durable hardwood ply. Non-glare, low-contrast polyurethane finish is easy on your eyes. Thick, centered bottom ledge holds books, binders, papers and pens. The center of the ledge (about a 10" length) extends out 3/4" to support thick books. The ledge tapers down on the sides so as not to interfere with your arms when writing. Non-slip, non-mar rubber feet protects your desktop. Sets up in seconds almost anywhere. Folds flat for travel and compact storage. SKU: 501-A - Small Adjustable Writing Slope - 14"H x 16"L. 9 lbs. SKU: 502-A - Large Adjustable Writing Slope - 14"D x 24"L. 11 lbs. 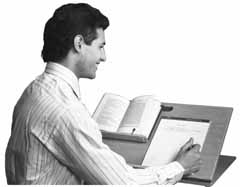 Triple-decker writing platform raises from sitting to standing heights. 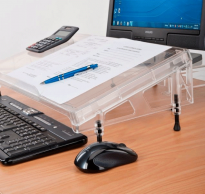 Transforms a flat surface into an ergonomic desk. Sets up in seconds almost anywhere. Flexible to suit your needs. A back-saver for office workers, teachers, students, and writers. Twelve adjustment angles promote better posture and enhance comfort while reading and writing. Handcrafted in the USA of durable hardwood ply. Non-glare, low-contrast polyurethane finish is easy on your eyes. 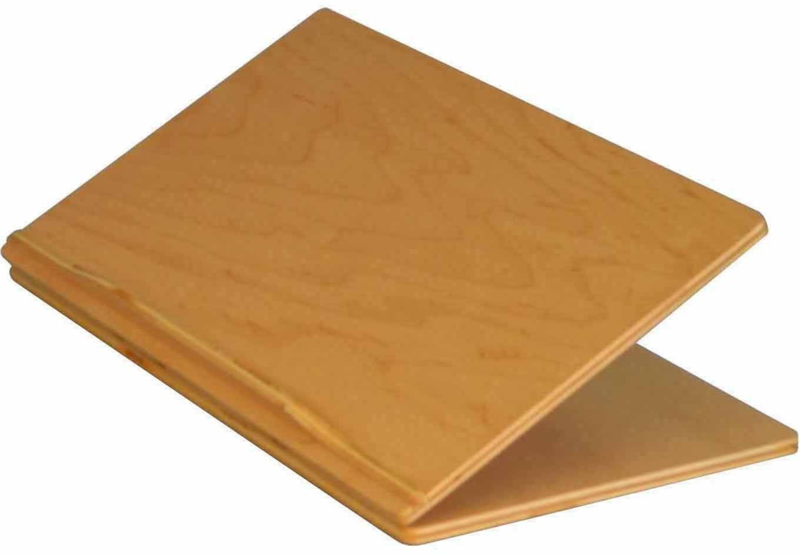 SKU: 504-A - Sit-Stand Podium Slant Board - 16"D x 24"L. 14 lbs.